Why Have Over 1.5 Million Americans Invested In Solar? Surveys taken over the last ten years confirm that the vast majority of owners (94% or more) consider that investment a wise decision. Consumer investment and satisfaction have spawned a small but growing solar hot water (SHW) industry here in the US that is providing even broader benefits to our nation and has the potential to contribute much more. Clean and Safe Solar hot water systems in use today produce approximately 1000 megawatts of energy annually. That is the equivalent of two medium-sized coal plants. The life-cycle costs of SHW systems are about the same as gas and far better than electric water heating systems. Solar energy is pollution-free, an important benefit when the cost of removing pollutants from the environment is considered. 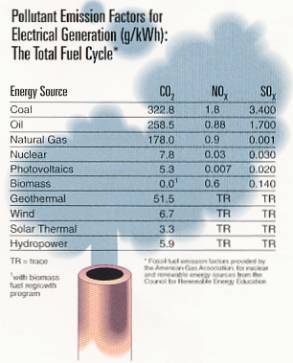 For example, a typical SWH system will, over its lifetime, displace 10.5 tons of CO2 if replacing a natural gas system, or 71.5 tons if replacing an electric system. The US Department of Energy estimates that Americans consume approximately 2.5 quads of end-use energy annually to produce hot water at a cost of over $20 billion dollars. Solar energy currently provides only a tiny fraction of that demand, but huge portions of our country possess sufficient insolation to produce much greater quantities of energy. Enough sunlight reaches the earth's surface each year to produce approximately 1000 times the same amount of energy produced by burning all fossil fuels mined and extracted during the same period. Sunlight does not have to be explored, mined, extracted, transported, combusted, transmitted — or imported. Solar water heating technology, pioneered in the US, is the oldest and most developed of all renewable energy systems. Modern solar water heating systems can provide a large portion (40 - 80%) of household hot water demand depending on local climate conditions and the size and type of system. 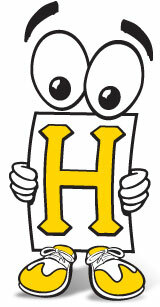 Most systems pay for themselves in four to sevenyears and continue to provide hot water for many years thereafter. 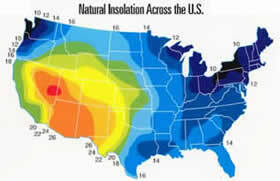 Much of the United States receives abundant sunshine, making solar hot water systems a very economical investment. This map shows the average daily solar radiation available on a south-facing surface measured in megajoules per square meter each day. Solar pool heating often provides an even better investment. Payback can be as low as two years and the solar system can extend the swimming season by several weeks without additional cost. Many homeowners have regretted the purchase of a conventional pool heating system after receiving their first utility bill. Another cost-efficient application for solar energy is preheating ventilation air for commercial and industrial facilities. The vast majority of US manufacturers of solar equip-ment voluntarily comply with national consensus standards devel-oped by the Solar Rating and Certification Corporation (SRCC). The SRCC tests and certifies collectors as well as complete systems for performance, reliability and durability. In addition, manufacturers and installers comply with the SRCC's strict requirements for proper installation, labeling and homeowner information regarding operation and maintenance. Assurances of performance and quality are backed by warranties that in many cases exceed the guarantees of other household appliances. Several utilities all across the country—from the Sun Belt to the Midwest and Northeast— offer consumers a variety of programs to reduce the initial cost of solar systems. In turn, the utility avoids the cost of installing additional generating capacity, especially power to meet peak energy demand, and using solar energy helps the utility comply with every-increasing restrictions on pollution emissions. In 1992, the US Department of Energy along with the Edison Electric Institute, American Public Power Association, and their utility and industry members established "Utility Solar Water" or USH2O. USH2O will serve as a forum for interested parties to develop and expand utility programs for residential and commercial solar water heating. Many state and federal government officials have acknowledged the importance of solar hot water systems in many of their programs. These systems are examples of installations resulting from a demand—side management program at Sacramento Municipal Utility District. The federal government builds, owns and operates more buildings than any other sector of the economy. Managers of these buildings are learning from the Federal Energy Management Program (FEMP) how solar and energy efficiency can be combined to reduce the energy load of their facilities and save millions of taxpayers' dollars. The federal government also subsidizes the monthly utility bills for millions of low-income families. The State of Florida and the US Department of Energy have established a pilot program to demonstrate that SHW on low-income housing can also save millions of dollars in federal subsidies. In 1960, jobs within the energy industry (including coal mining, oil and gas extraction, petroleum refining, electric and gas utilities) represented about 1.8 percent of total US employment. By 1990 that share fell to 1.2 percent. "This ratio likely will decline further over the next decade," the US Center for Global Climate Change reported in 1993. 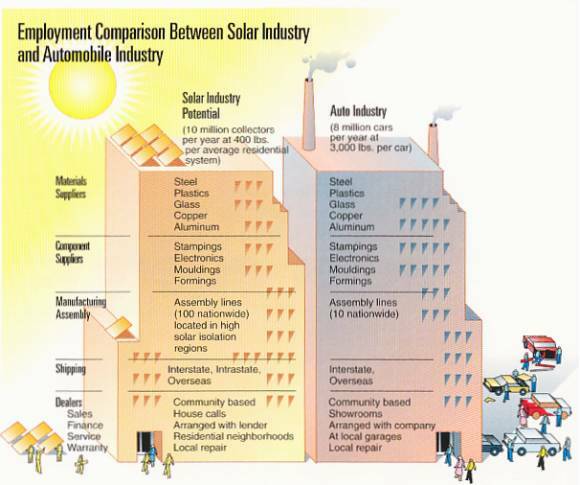 Employment patterns resulting from conventional energy technologies are dominated by the capital-intensive nature of the industry. When measured in jobs per million dollars of annual expenditure, coal, oil, gas and nuclear technologies support among the fewest jobs of any economic activity." The solar water heating industry is a good example of the type of manufacturing needed to create both new skilled and unskilled jobs. The Housing and Urban Development agency has undertaken a project to establish criteria and mechanisms that would allow mortgage lenders to give homeowners an advantage for solar and energy efficiency measures when purchasing a new or used home. Solar water heating systems are already eligible for the energy efficient mortgage programs which allow homeowners to have higher debt-to-income ratios, thus allowing them to qualify more easily for financing. In fact, when SHW is incorporated into a mortgage, the monthly finance charges attributed to the new system fall below the monthly energy costs and give homeowners money in their pocket every month. 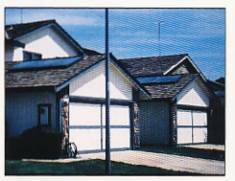 In 1993, the National Association of Home Builder's Research Center included SHW, as well as other solar options, in the Resource Conservation House, a single-family residence built to demonstrate to builders the characteristics and advantages of the many new products on the market that are conserving our nation's energy resources. The United States is striving to reindustrialize with new technologies that create jobs yet are environmentally benign. The US solar water heating industry is comprised of the manufacturers profiled in this brochure plus many distributors, installers and maintenance companies nationwide. 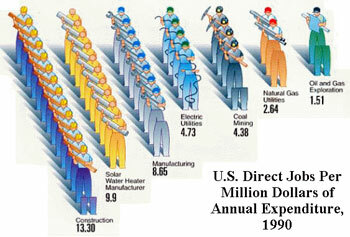 The question many people ask is "How can the US save money, help our environment, and create jobs?